Rapid urbanisation and unplanned development have taken a toll on Bengaluru's lakes. Storm water drains that are meant to carry only runoff water during rains now carry the city's sewage, and many of them discharge the filthy water directly into the lakes. “The condition of the majority of the lakes in Bengaluru is poor because of discharge of sewage and encroachment. If proper action is not taken in the next five years, majority of the lakes will die,” says Ayi Vaman N Acharya, chairperson of the Karnataka State Pollution Control Board (KSPCB). The city once had about 2,000 lakes, but only 60 of them remain. To salvage the lakes, KSPCB and the Bengaluru Water Supply and Sewerage Board initiated a project in January. The board along with the water utility has developed a decentralised system to collect the sewage from drains, treat it and then discharge the treated waste water into lakes. “It is not a permanent solution but a short-term arrangement. It will take a decade to install underground sewerage network in the entire city. We cannot wait that long,” adds Acharya. The storm water drains were initially directed into the lakes to recharge them and there were separate channels for domestic sewage. In due course of time, because of poor sewerage and haphazard expansion, sewage of the city was directed into the storm water drains, and from there into the city lakes. The system installed at KR Puram Sewage Treatment Plant (STP) in eastern part of the city involved constructing a medium height barrage across the Kaluve drain and collecting the sewage through a pipe by gravity in a pit. From the pit, the sewage is pumped into the STP, which treats the sewage and releases the treated water into the same drain ahead of the barrage. Thus only treated waste water reaches the Vengayyana lake. The inlet quality of sewage is around 250 mg/l BOD and outlet concentration is just 5-6 mg/l BOD (biological oxygen demand is used to gauge organic pollution and indicates the amount of oxygen required to oxidise organic matter in water through microorganisms). 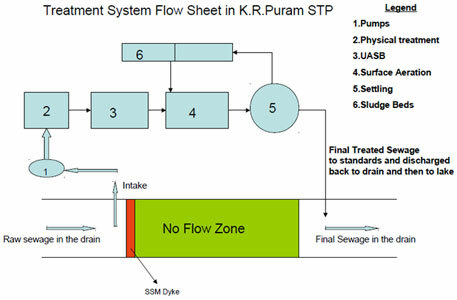 The KR Puram STP has extended aeration system followed by UASB, which also takes care of nutrient removal. The upflow anaerobic blanket reactor (UASB) is a single tank in which waste water enters the chamber from below and is made to flow upwards; a suspended sludge blanket comprising microbial granules (microbe agglomerations) treats the waste water as it flows through it. Apart from preventing pollution of the Vengayyana lake, the project has also increased the capacity utilisation of the STP. The installed capacity of KR Puram STP is 20 million litres a day (MLD), but only 5 MLD of sewage reached the plant earlier. 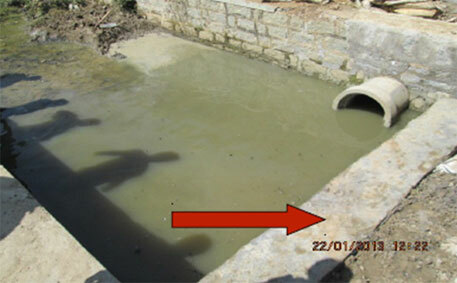 After the barrage was installed, the total sewage that reaches KR Puram STP is 12 MLD. “The total installed capacity of STPs in Bengaluru is 721 MLD, but only 56 per cent of Bengaluru’s installed STP is utilised because of poor sewerage network. If such systems are installed in other parts of the city, then capacity utilisation of other STPs will also increase significantly”, says a senior official of KSPCB. “The new system consumes minimal resources, can be installed in seven to eight days and the results are instant,” says Acharya. In this case, the cost incurred was only Rs 95,000. KSPCB is now planning to ask industries and builders to take responsibility of restoration of lakes polluted by them. The board is also planning to look for ways to use water cess charged by the water utility for lake restoration. “The water cess money is not being used judiciously. My special emphasis is on saving smaller lakes with projects that are small, can be completed within six months, says Acharya. Capacity utilisation is the best option . After reading ur article i understood that very less quantity of sewage reaches to these stps. I think there is need to concentrate on sewage carrying drainage system as well as pipeline to reuse treated sewage for gardening etc. After this existing stps may be upgraded to achieve desired water quality. A very useful piece on reuse of sewage of the cities and it is very relevant for the NCR region, especially Gurgaon city. I have faced similar problems in our colony where the storm water drain was converted into sewage drain. We approached the High Court to resolve the problem. There is tremendous opportunity to use treated sewage to revive village water bodies that are being encroached in the city. 1.0 The statement "The new system consumes minimal resources, can be installed in seven to eight days and the results are instant,Ã”Ã‡Ã˜ says Acharya. In this case, the cost incurred was only Rs 95,000." is tough to accept? As per the system of treatment mentioned above alongwith UASB, the cost of any capacity project will be much more that Rs 95,000. However efforts of SPCB Karnataka are appreciable. 2.0 I would like to share one thing here that the interception and treatment has many lacking in treatment process control like variation in flow, variation in quality, shock loading etc. Well written article on the sewage issue! The important thing is to replicate this in all the major cities and on a practical level, speed up the underground sewerage network. Rs 95,000 was spent only on installing pipeline and building the barrage, It does not includes the cost of STP with UASB technology. STP with UASB technology was installed much earlier. The installed capacity of KR Puran STP is 20 MLD. Before setting up of this system, it use to receive only 5 MLD. I believe existing STP can handle variation in flow and quality. Thanks for critically reviewing the article. KSPCB and BWSSB is in the course implementing the similar schemes in other STP's and will try draw untreated sewage flowing in the open storm water drains and in turn leading to waterbodies and treat the same and discharge back to drain. Here there is no technology involved nor required. It is a simple thinking to attain maximum. Such kind novel ideas can be extended to other big cities/town in our country and protect our water bodies. Further, one should note down that, it is only short term measure, once, BWSSB attains complete networking of sewerage system, then all that sewage that is generated will pass through the treatment system and that is likely to complete by 2015. Well written and wonderful initiative taken up by the KSPCB. As majority of lakes are sources of water supply to urban areas, this type of initiative would also reduce cost of water treatment. I am glad to see that such good effects can be reached through relatively simple actions! Your article shows the importance of duplicate sewage systems and the importance of doing the right thing right from the start. It's far more complicated to construct sustainable long-term solutions in retrospect. To lead cleaner runoff water to STPs will also dilute the sewage, making it more difficult to treat properly. 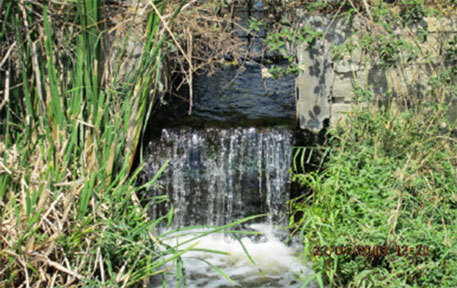 During heavy rainfalls the flow of runoff water to the STPs will be high. I like the approach very much. Actually it is the great need of the hour, especially in urban / peri-urban areas. In Guwahati also, there is river called 'Bharalu' meandering through the city area. But most unfortunately, it has turned out to be just like a sewer line and nobody seems to bother about that. The immediate need here is a 'Bharalu River Action Plan'. I alonwith some of my friends tried to form a pressure Group to initiate Bharalu River Action Plan, but till date I have failed to motivate for such a Plan. I don't know, what will follow / happen and what to do and how to materialise. I interact with Sector Experts in this regards, whenever I get opportunity. You may get in touch with CSE's team working on river pollution issue. KSPCB and the Bengaluru Water Supply and Sewerage Board initiated an excellent work towards the restoration of lake of the city through sewage water management..
# to keep separate drainage line for storm water and effluent / sewage line..
First of all congratulations for a wonderful piece of work you have done by highlighting some good work. Nowadays it only bad things which we usually get to know. This is a great work done by KSPCB and I am sure this will show positive results very soon. We at J&K, were facing the same type of pollution problem at world famous Dal-Lake a couple of years before. Then some serious work was undertaken by the J&K Govt. and at present there are 6 STP's at work around the periphery of the lake to cater the outer catchment area, which has shown some positive signs but the task is not finished as yet. There is a huge task ahead. If neighbourhood citizens/stakeholders get involved in brainstorming common problems via convenient and interactive web based platforms as have happened at the city of Rochester, NY (courtesy one of their earlier mayors), costs of such solutions would be next to nothing. Citizen participation is deliberately controlled and information is restricted (as to solutions proposed to the govt authorities ) and the worst possible system is implemented to make a few bucks and perpetuate a simple problem so that it deliberately becomes intractable. The Janaagraha.org experiment has intelligently helped equalise control over the local govt by citizens viz a viz a few vested interests who were controlling the authorities. I am glad to read that the Karnataka Pollution Control Board is initiating a project to divert sewage that fall into city lakes. I hope this plan executes well so that a lot of fresh water bodies can be saved from getting polluted. Thanks for the post.